There are times when we just need to send our toddlers and children outside to burn off the seemingly endless amounts of energy. Also, has anyone found a way to bottle that energy up yet? With older children it’s easy to send them outside and tell them to entertain themselves. With toddlers (kids age 1 to 4 years old) they sometimes need a little more direction, i.e. TOYS. With the right toys and props, toddlers can learn various motor skills, co-playing, role-playing, and creative thinking. Another important factor to look for with outdoor toddler toys is their ability to burn off larger amounts of energy! We’ve done the research, and here are the best outdoor toys for toddlers. The Intex Rainbow Ring Inflatable Play Center is one of the mammoths of backyard toys for toddlers but is sure to bring tons of fun with it. Equipped with a water slide, wading pool, water sprayer, and ring toss game (with 4 inflatable rings), this Play Center is perfect for the heat of summer and turns into a mini water park. Don’t feel like filling it up with water? 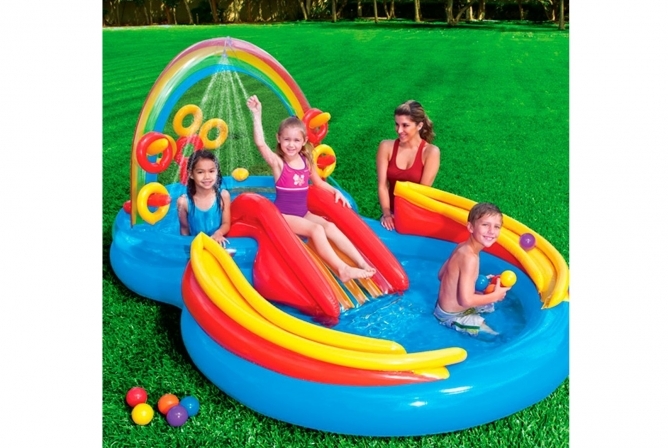 Well, lucky for you, this Inflatable Play Center can be used without water with just as much fun. Many parents doubled the use of this play Center by inflating it during the colder months (indoors or outdoors) and filling it with a bunch of plastic balls for a homemade ball pit. What toddler wouldn’t be having the time of their life with that?! One accessory that needs to be bought (unless you plan on blowing it up with your lungs…good luck) is an electric air pump like this one. It will seriously be a lifesaver! 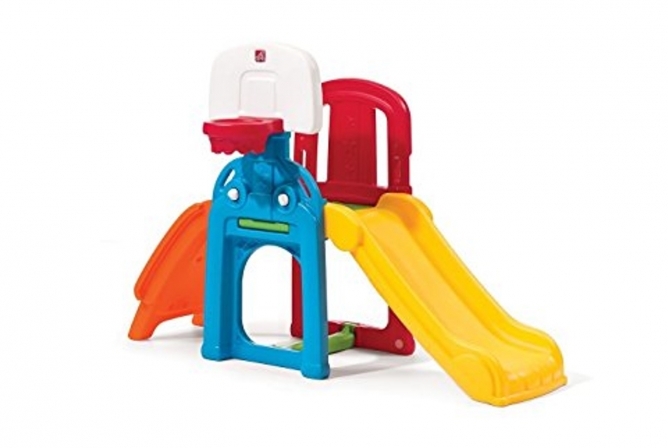 You cannot go wrong with this backyard toy for your toddler, as it can be used for many years to come and is perfect for co-play with other siblings. The Inflatable Play Center MSRP is $59.99, but check the current Intex Rainbow Ring Inflatable Play Center – Amazon price. For many toddlers and babies, a popular item is a mini backyard jungle gym (before they graduate to a big-time swingset). The Step2 Game Time Sports Climber is a perfect starter for little ones to get used to maneuvering jungle gyms due to its small size and easy-to-use format. This unit features a climbing ladder, slide, basketball hoop, soccer goal and toss through wall and helps kids learn to toss, shoot and kick on target. It also comes with a multi-purpose little ball that’s small and easy enough for little hands to handle. But what if your little one isn’t a little Sportster? The Game Time Sports Climber is still perfect for a first mini jungle gym and still helps with large motor development with stair and slide maneuvering, and fine motor skills by dunking the ball in the included basketball hoop. With a weight limit of 60 pounds, this jungle gym can be used for quite a while and can also fit in small yards (or homes) due to its compact size. MSRP for the Sports Climber is $99.99 but check out the Step2 Game Time Sports Climber – Amazon price right now. 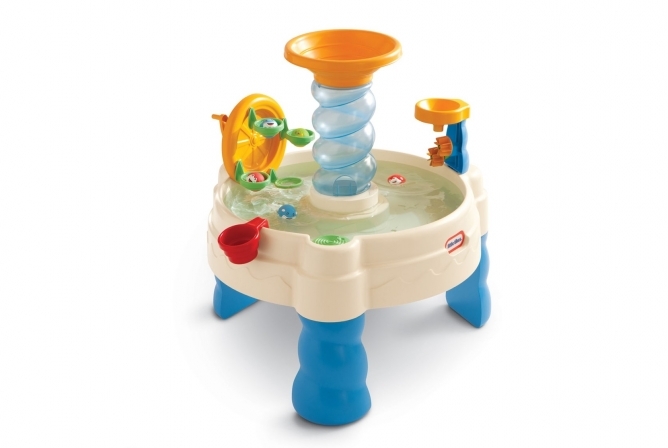 Another great option for warm summer days (or any summer day) is the Little Tikes Spiralin’ Seas Waterpark Play Table. This water play table helps develop “put-and-take” and early motor skills with fun characters and includes 1 water cup and 5 round characters that squirt water. Drop balls down the spiral, turn the Ferris wheel to scoop up and drop off balls, or fill the cup with water and pour into the funnel to power twin water wheels. With water being such a great sensory element for toddlers to play with and explore, this Play Table will keep them entertained while developing fine motor skills. Another great use for the Play Table that other parents have done is filled it will sand and used it as a Sand Play Table if your kiddo isn’t keen on water. Obviously, some pieces wouldn’t work the way they are intended (as they’re meant for water), but some kids prefer sand over water. The MSRP for Water Table is $49.99, click here to find the current Little Tikes Spiralin’ Seas Waterpark Play Table – Amazon price. If there’s one thing about kids, they have tons of energy to burn. When little ones don’t burn that energy off, it can be hard to concentrate, behave properly, or even get quality rest that they need. Enter the Little Tikes 3′ Trampoline. Buying a trampoline comes with its own risks (as does any large-motor toy) but can be a lifesaver for parents and children alike. When you’re kiddo has some bottled up energy (which is like, every moment of every day) send them to the trampoline. As they work out their whole body, kids will develop better fitness, balance, and coordination. This 3-foot trampoline has a balance bar for small children to hold onto for balance and stability as they jump. The balance bar can help keep them stable while also pushing them to jump higher, faster, and more safely for greater energy burning capabilities. It has a max weight of 55 pounds, so it’ll be able to last quite a while and is still safe for younger children to use. 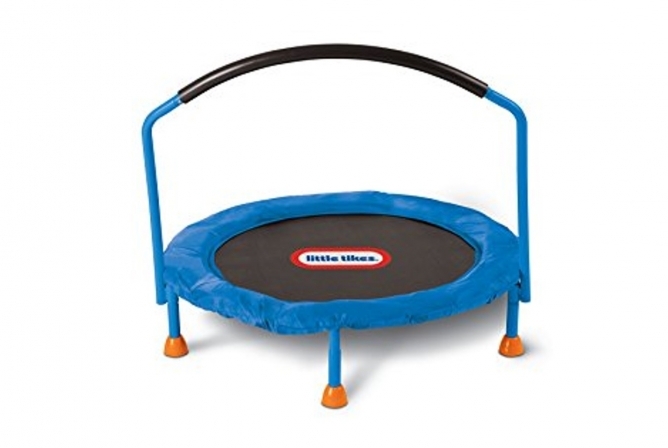 MSRP for the Trampoline is $67.99 but check the Little Tikes 3′ Trampoline – Amazon price here. Okay, let me start off by saying, what toddler doesn’t adore bubbles? If your kiddo is a bubble lover, and you’re on a tighter budget, then the ArtCreativity’s Bubble Blaster Set could be an awesome backyard toy for your toddler. It comes with 1 Dalmatian bubble blower gun, 1 Duck bubble gun, batteries, and 4 bottles of bubble fluid to get the fun started right out of the box. These bubble blowers for kids are crafted in ultra-cute designs to capture any toddler’s imagination. Every press of the trigger also produces a beautiful LED light show and exciting sound effects that add an extra dimension of awesome to the bubbly fun. Unlike other bubble machines that require dipping wands into bubble solution, this bubble gun kit just needs the bubble solution to be screwed into the base of the blaster. Avoid time-consuming clean-up with mess-free summer outdoor toys for toddlers. 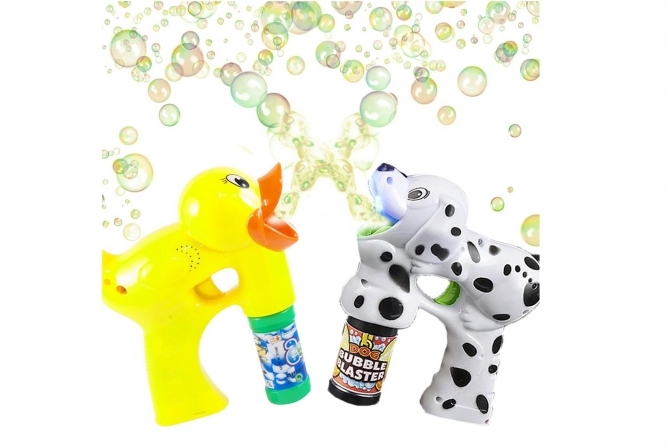 Using these Bubble Blasters will help improve hand and eye coordination and fine motor skills and are sure to keep your kiddos entertained. The MSRP for the Bubble Blaster Set is $30 but check the ArtCreativity’s Bubble Blaster Set – Amazon price here. Playing outside is perfect for big play and exercise. Utilizing gross motor skills (think jumping, running, and big movements) is super important for toddlers and children and helps them burn off some pent up energy and steam. Outdoor play help develop those skills. Also, a lot of these toys can be utilized inside during the colder months and can still be useful for indoor big play. Looking for toys that spark imagination, creative play, educational skills, and co-playing are good points to look for when shopping for the best toys for your toddler. Thinking about their qualities and interests will help you to decide what toys they will use and learn from more. And, as always, there’s nothing more exciting than watching your child’s personality and interests develop through playing and the toys they are surrounded with at home. To find some other awesome toddler toys, check out the Best Toddler Toys here!